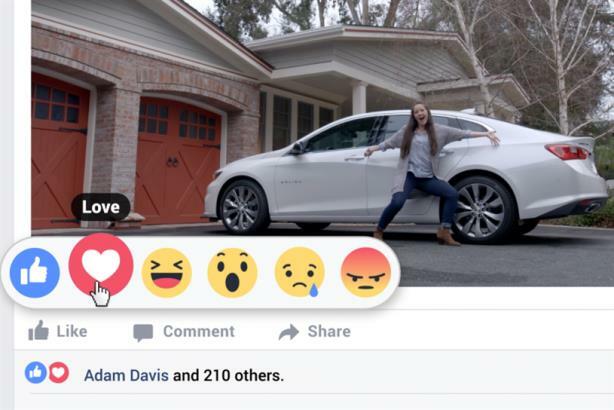 Chevy releases Facebook-themed ad to coincide with the debut of Love, Sad, Haha, Wow, and Angry buttons. What do the expanded options mean for brands? PALO ALTO, CA: Warning: Consumers on Facebook are about to become a lot more emotional. 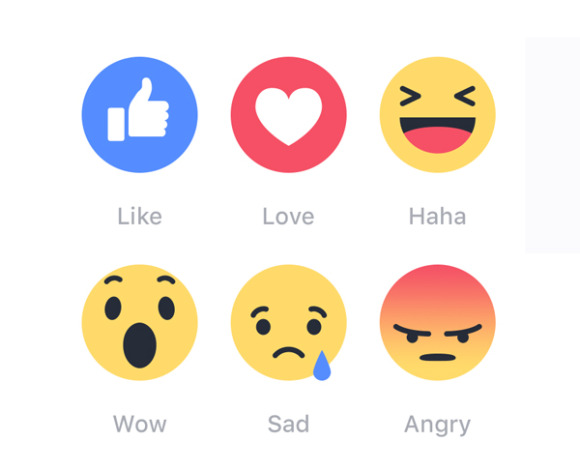 Starting on Wednesday, Facebook is rolling out the long-awaited update to its iconic Like button, arming members with symbols for "Love," "Haha," "Wow," "Sad," and "Angry." Collectively known as Reactions, the expanded list of emoticons is being introduced globally after a five-month test that began in the Irish and Spanish markets before expanding to Chile, Portugal, the Philippines, Japan, and Colombia. For consumers, they represent a greater opportunity to express their feelings — positive or otherwise — about posts from friends, publishers, and advertisers. For brands, they bring the promise of greater engagement with consumers and a chance to cull more granular data from the world’s largest social network. But they also transform Facebook from a relatively safe space where the only way to complain was through a comment — which brands could always delete — to a more freewheeling environment in which anyone can express outrage with a click. Facebook is confident brands are willing to take the risk. "I think the first reaction we would expect is nervousness, because, ‘Oh my gosh, now there are going to be ways for people to respond multi-dimensionally to the things that I'm posting,’" said Richard Sim, director of monetization for ad interfaces and News Feed ads at Facebook. "I think that's a very natural reaction, but as a business, I ultimately want to know how people think about the things that I'm saying." To mark the launch, Chevy is releasing an ad starring the new Reactions called From Like to Love. After showing dozens of Facebook posts that people are satisfied to "Like," the commercial presents the 2016 Malibu as something to "Love." The 60-second spot was created by agency Commonwealth/McCann. The automaker began working on a tie-in ad with Facebook once news broke last year about Reactions testing. "I think it’s a huge opportunity as this unfolds and as we get consumer reactions to a number of different communications, not just this particular one," said Paul Edwards, VP of marketing at Chevrolet. "It adds another dimension to people engaging with Chevrolet as a brand." The video will run on Facebook and adjacent to related online editorial content. Business and brand pages get the same Reactions functionality as personal Facebook accounts – the available responses are the same, and brands can’t disable any of them. 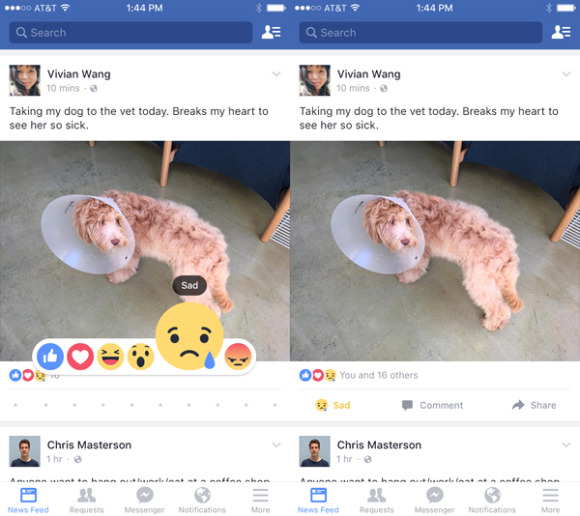 "Right now the Reaction set is consistent across all posts and across all countries," said Sammi Krug, Reactions product manager at Facebook. "There is not a way to turn off a particular Reaction." The new list of icons appears when desktop users hover the cursor over the Like button (or press and hold on mobile). Each Facebook post will list the total number and kind of Reactions. The global rollout process will take a few days to reach the entire network, and mobile users will need to download the app update to access Reactions. Certainly, the more granular feedback afforded by Reactions will be a boon for data-driven marketing. Brands have long complained that there’s a low bar for getting Likes as people scroll absent-mindedly through their News Feeds. In contrast, Reactions other than Like require a brief pause and an active selection, providing a bit more time for messages to sink in. And now brands will be able to distinguish between people who are happy to proffer a thumbs-up and those who say they Love a message or a product – a valuable subset of fans who are likely more amenable to targeted messages. "It's a really good way for people to get a high-fidelity signal on how people are feeling about the things that they're posting," Sim said. "For a business, it's great because it will enable us to just do a much better job getting their content to the right people based on this additional signal that we have." In addition to better targeting capabilities, Facebook expects Reactions to expand the kind of content that plays well across the network. Nearly everyone has experienced that moment of hesitation over "Liking" sad news from a friend or a disaster relief organization. Now people who have avoided engaging with those kinds of posts will have more suitable options, which could expand the reach of tear-jerking commercials, for example. "Clicking the Sad button is such a lower cognitive load than having to actually write, ‘I'm really sorry,’" Sim said. "If I'm Coca-Cola or I'm P&G, often times I'll launch campaigns that are really trying to reach a deeper kind of emotional connection with my audience. Through Reactions, I can actually see if I'm hitting some of those other types of emotions." While Reactions introduces more options for audiences on the front end, the new choices will still interact with paid ads, boosted posts, and metrics on the back end in the same way — at least for now. "At this stage, we're not treating those any differently," Sim said. But brands that do pay for Facebook ads should be able to get a better idea of which kinds of posts will benefit the most from additional spending. "If I post it organically first, I can get a pretty good signal about how it's resonating with my audience, and then I can choose to scale that impact." Though Facebook is eager for brands to embrace the new Reactions, the company isn’t advising them to change their social media strategies just yet. "If what you're doing as a business has been working for you in ads and page posts, keep doing that, and Reactions will only help us improve on those capabilities," said Mike Manning, corporate communications manager at Facebook. "Because they're treated as Likes in the back end, any engagement with it is treated as engagement in our system, the same way it has been with Likes. So, the value we assign to it in our algorithm for ads and for organic posts is going to be the same, ultimately, in the system to start." But brands are advised to stay abreast of developments in the Facebook interface. The company is planning to make future changes to Reactions, potentially adding features or controls, depending on feedback from users and advertisers. One change that has already occurred was the removal of the "Yay" Reaction, included in the original announcement in October 2015. "A big thing that mattered to us was to make sure that across different cultures, all of the Reactions would be equally useful and applicable to all of the different cultures that we're launching to," Krug said. "After we started testing, we did iterate on different Reactions within the set, and we did make some changes after that." Coming nearly 10 years after Facebook launched, the expanded Reactions represent a major change for the network and its users. But they also reflect the changing nature of digital advertising, in which brands are expected to confront public opinion openly and often, according to Sim. "We've come a long way in terms of businesses who are embracing the opportunity to have a conversation with people, and to recognize that they can't completely own it," he said. "Companies such as Oreo and P&G, they've done such a great job in creating this dialogue with customers. I'm hoping that it will further push businesses to recognize the additional value that they get by having this dialogue and understanding how people are thinking about the brand and the things that they're posting."